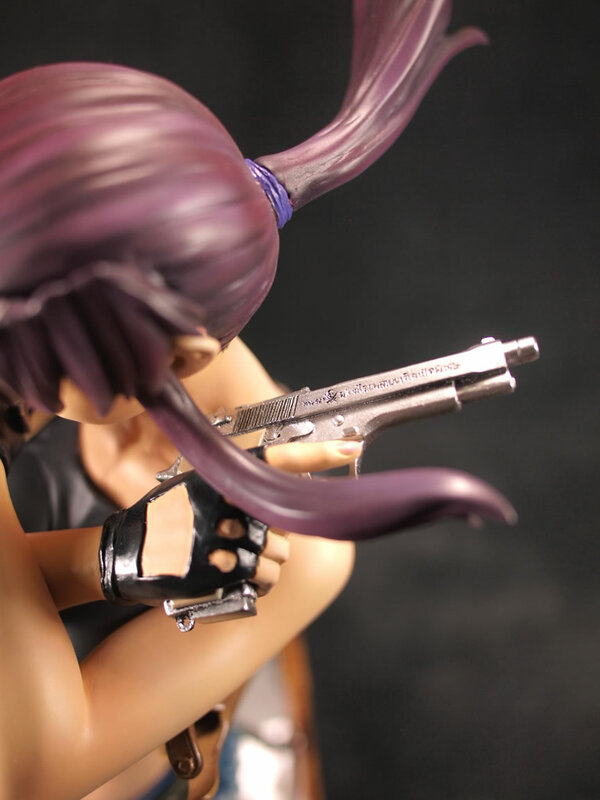 Several weeks ago, it occurred to me that I had yet to build a resin figure this year. I’ve been building fewer projects over the course of a year, but so far I’ve completed the resin conversion Efreet Custom and my little Nu project. Yes, the Efreet is mostly resin, but it is definitely not a figure kit; so picking through my pile, I narrowed down a few during the August build gathering. 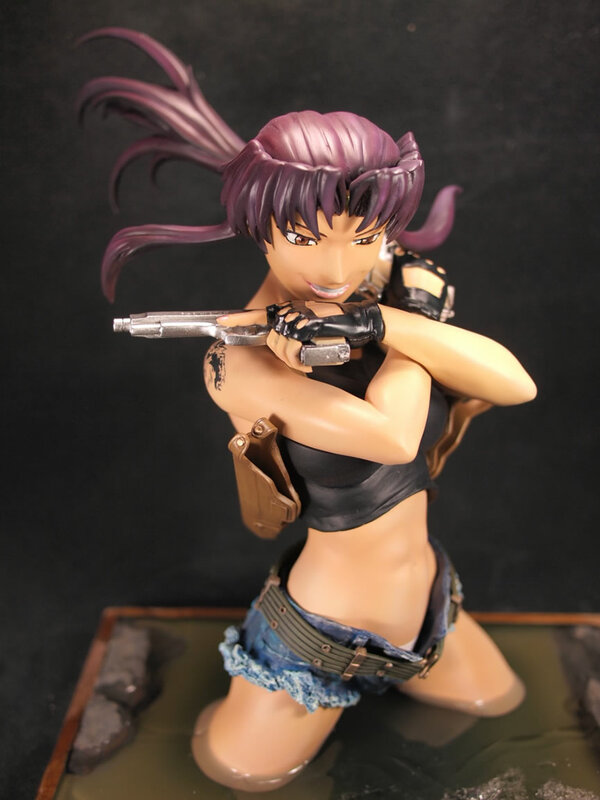 The Dutch and Revy kit pulled to me, and looking at the quick fit of things, I decided on the Revy which looks like it’s about a 1/4 scale bust kit. So we begin, with Step 1: Basic building and pinning. I actually quite enjoy this step, the rough excess resin tabs are cut and the kit comes together in unpainted resin pureness. One of the build guys, Manuel, lent me his jeweler’s saw, which cuts through the resin like butter, and reduces the chance of resin chipping from using clippers. 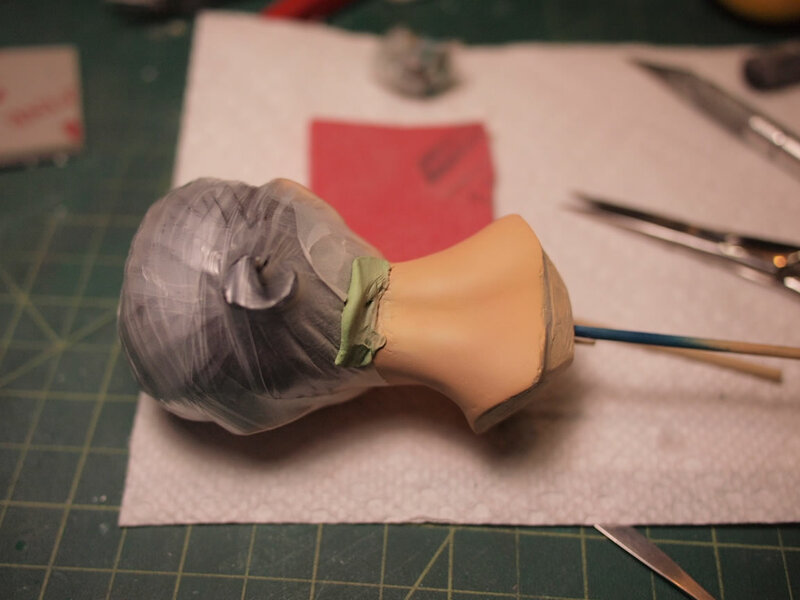 However, there is a real possibility of slipping and cutting into the resin parts other than just the excess resin, so care needs to be taken – especially since these saws can take off skin and bone just as easily. 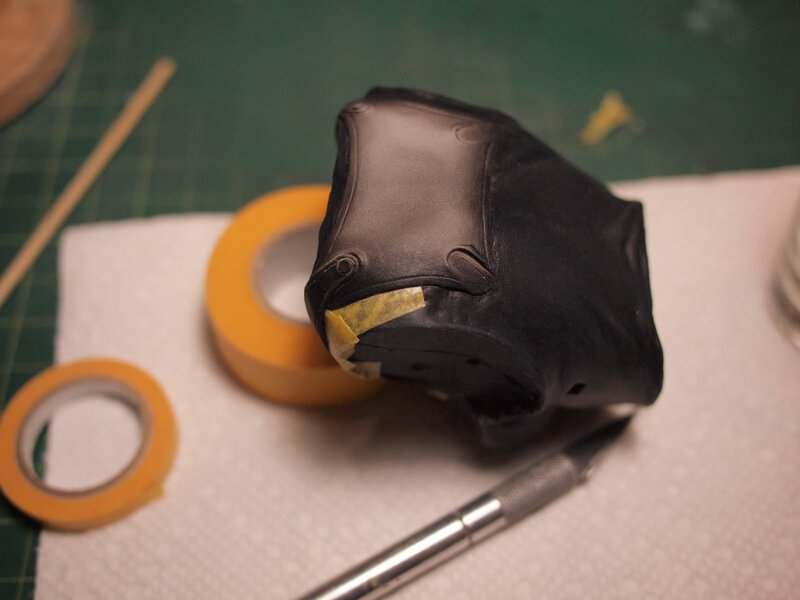 Excess resin is removed here and there while the parts are test fitted, making sure parts are snug and aligned. 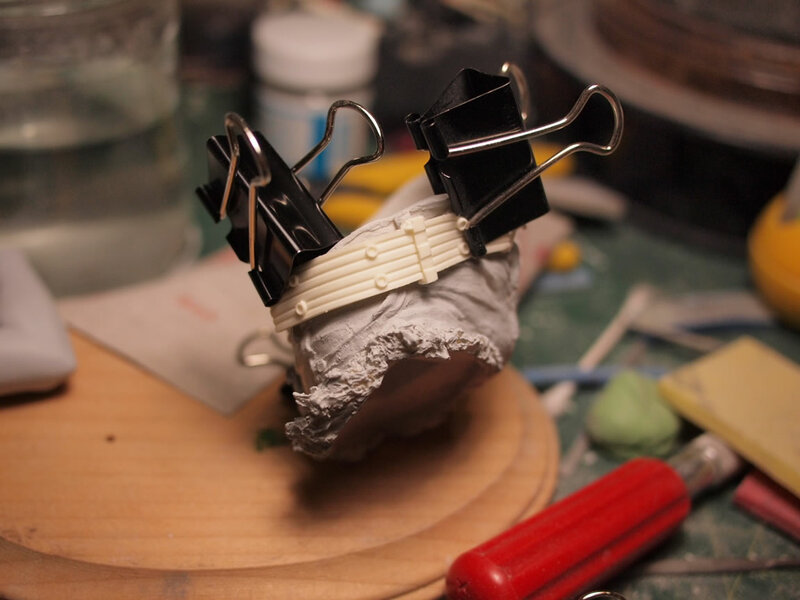 Once this is done, some of the parts are carefully pinned trying to keep true to the alignment. Here I can see what pieces need reshaping or realignment. 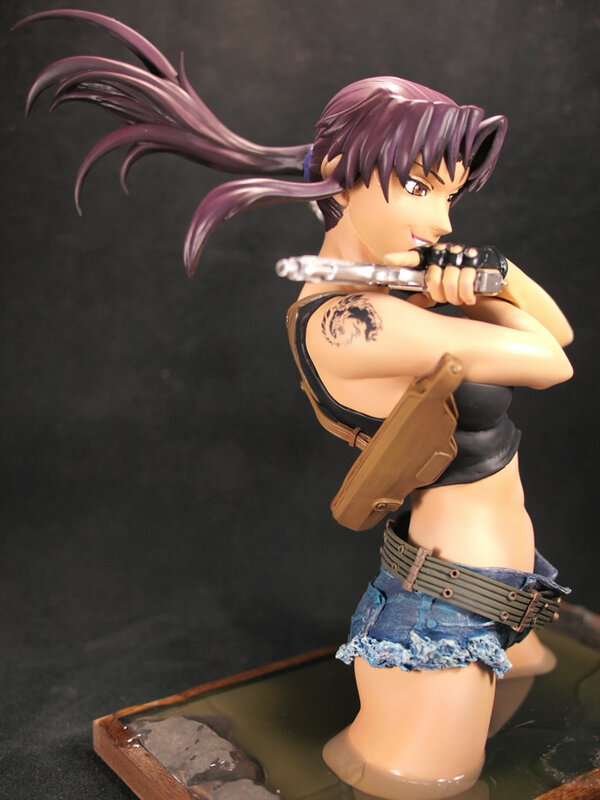 One of the first things I noticed the belt doesn’t fit well around Revy’s waist. This will definitely require some reshaping. 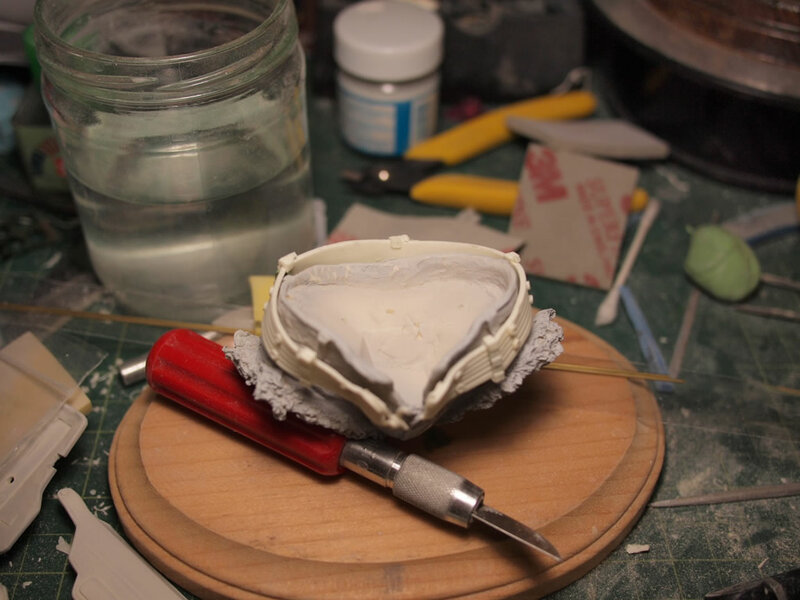 There are several ways to reshape resin, all of them use heat. Hot water baths work as well as heat guns. 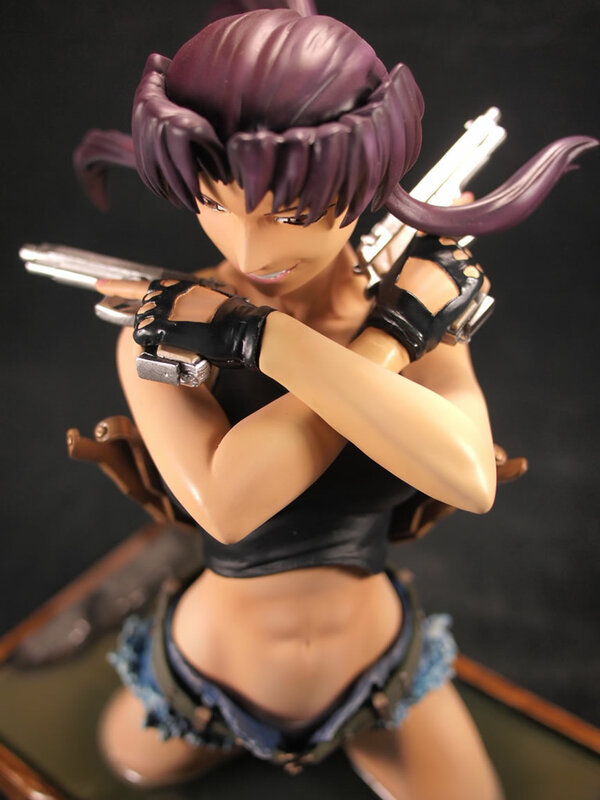 For this, I’m using some paper clips to clip the belt around her shorts, then using a hair dryer to apply the heat. The paper clips help keep pressure on the parts and when the resin is soft from the hair dryer, the belt conforms to the shape of the jeans. 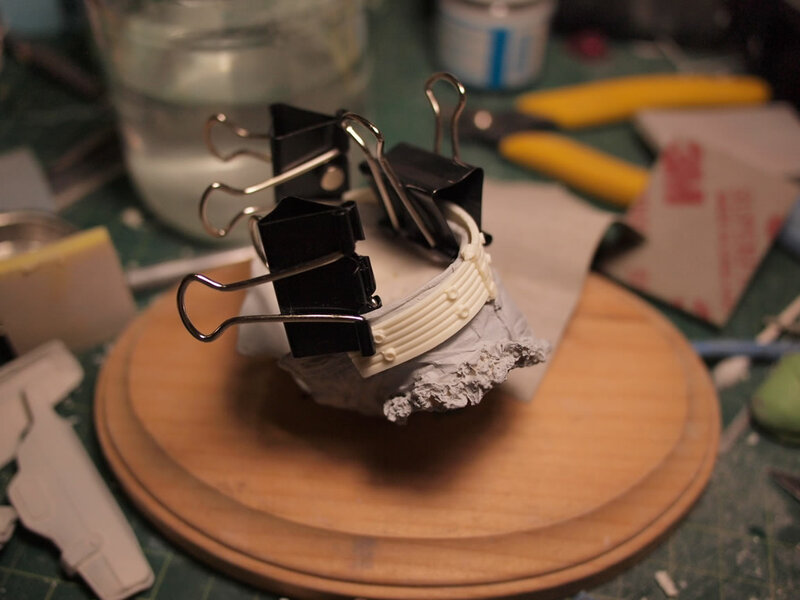 Removing the heat source and keeping the paper clips in place while the resin cools ensures that the belt retains the shape. 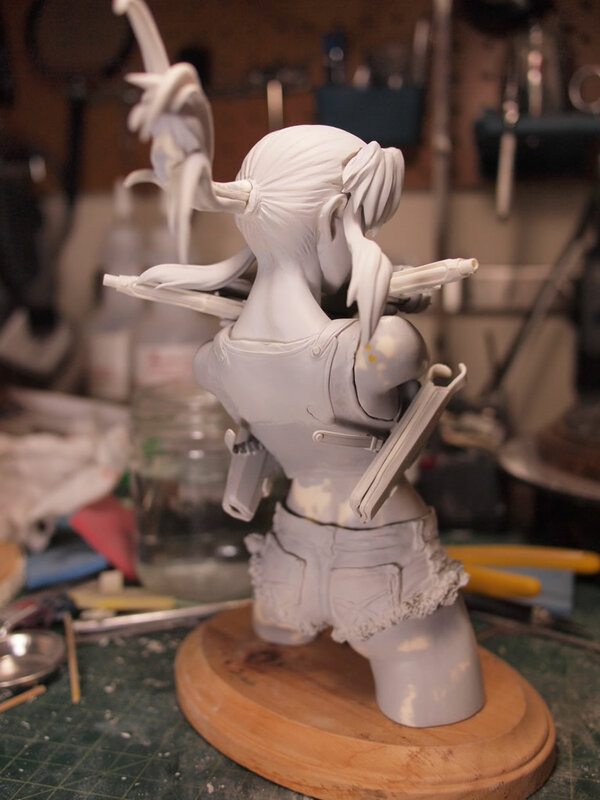 To straighten a piece of resin, the same method can be used. 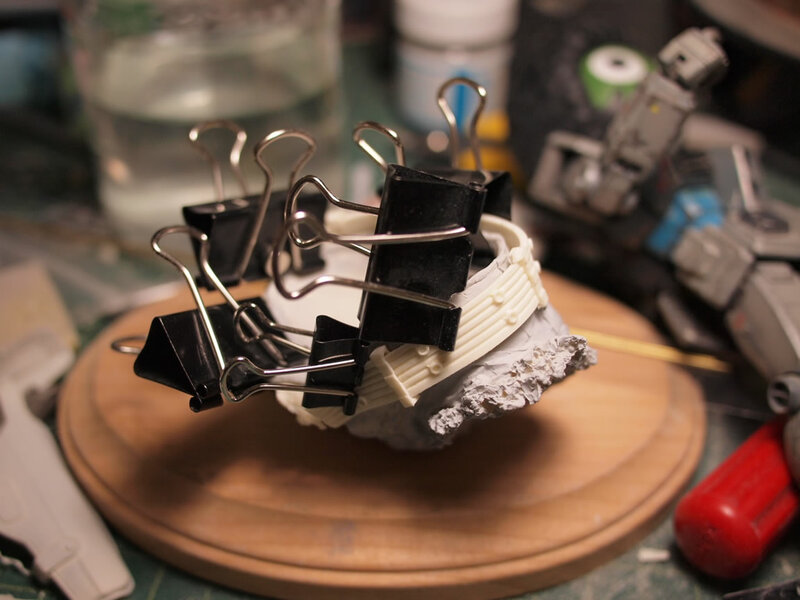 Just sandwich the part between two metal plates, thick acrylic plates, wood, etc, then clamp them together with a large paper clip and apply the hair dryer to heat up and soften the resin. 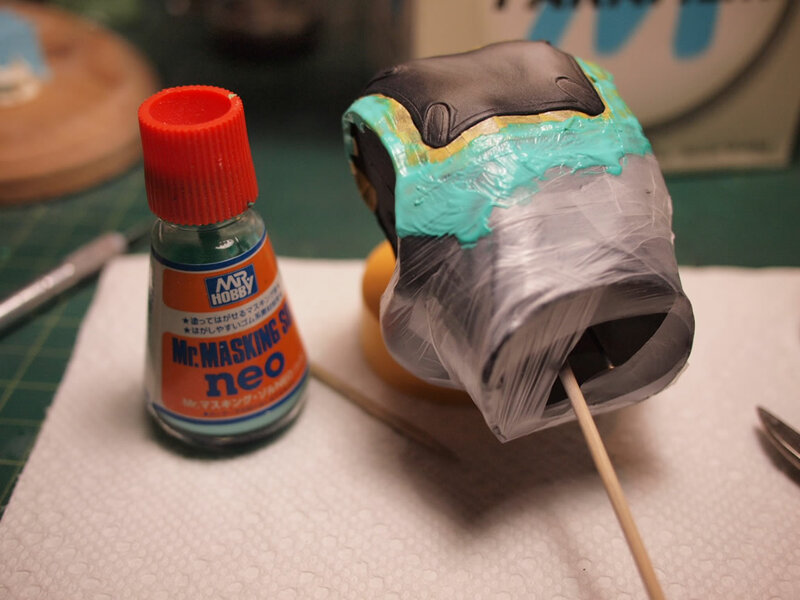 Remove the heat and allow the assembly to cool and you get a straight piece of resin when all’s said and done. 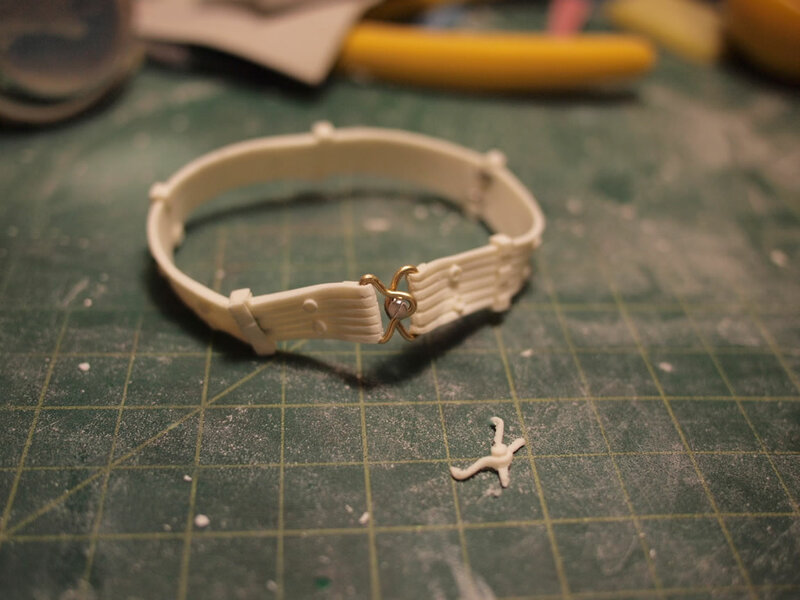 The buckle for the belt is a piece of resin with a good bit of mold line and excess resin to sand away. It is also delicate as all hell. One piece of the belt already broke off. So the decision to completely replace the buckle was easy. Two clips and the original buckle is gone. Holes are drilled at the ends of the belt where the original buckle ended. 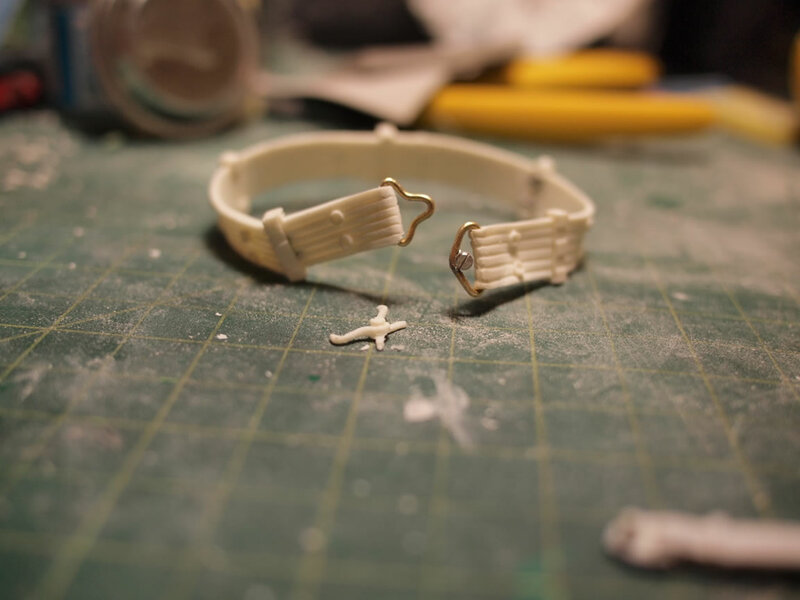 Some 1/16″ diameter metal rods were bent and shaped as the new buckle pieces. 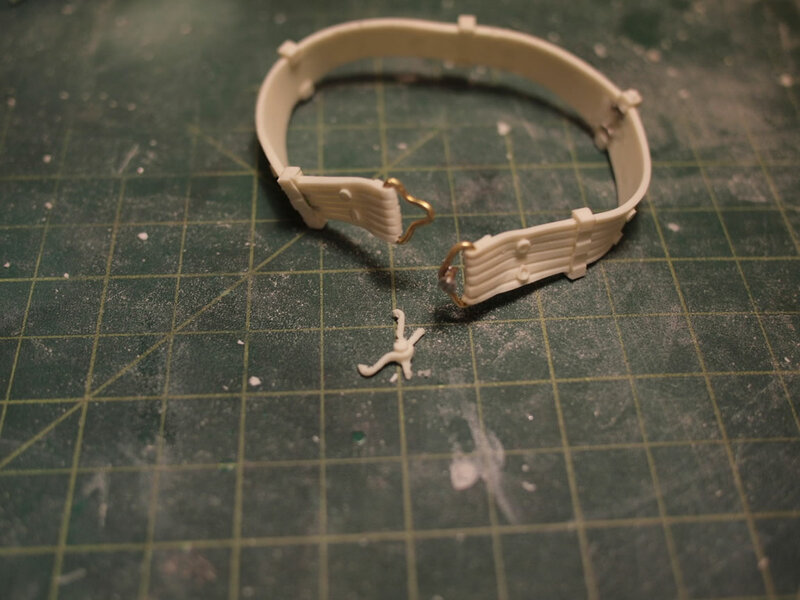 I used a 1/16″ metal tube as the main piece of the buckle connection point with a metal minus mold piece as the points tip. This assembly was super glued to the one end of the belt buckle as a quick tap weld, then actually welded in place with a soldering gun. The new buckle is now functional. Next up is the surface prep stage, Step 2: (is a really long step). 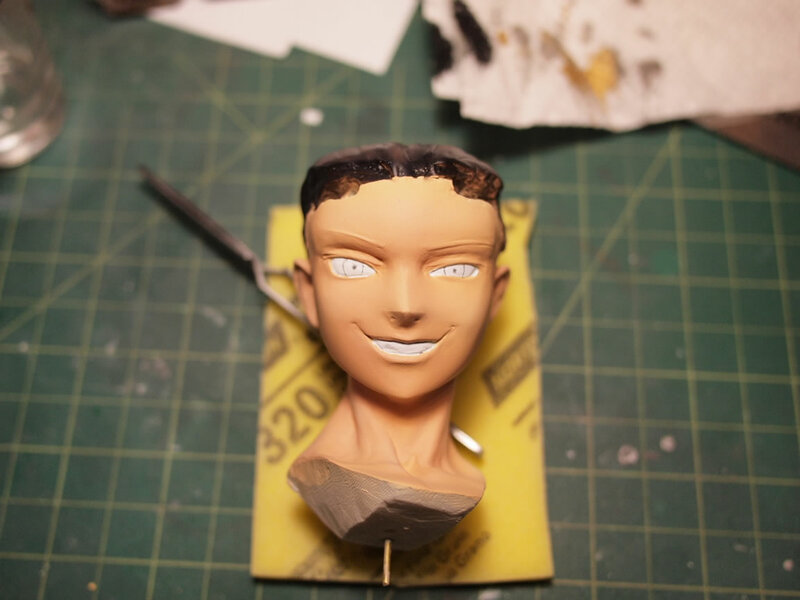 It all starts off with the initial sanding to remove mold lines, clean up around the previously cut excess resin tabs. 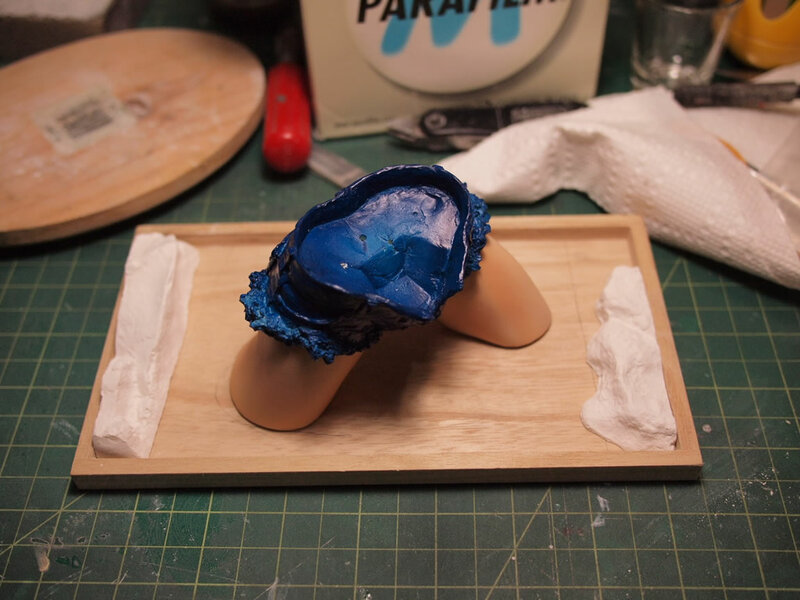 Any visible surface bubbles revealed in the sanding process are opened up with a hobby knife, and once this first sanding step is done, the parts are thrown into a bath of industrial strength cleaner. 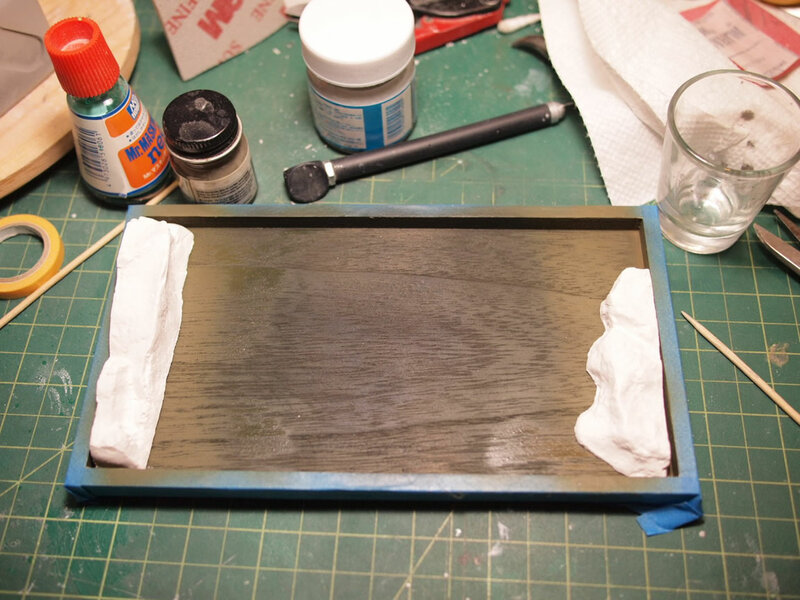 This removes any mold release residue which will keep primer and paint form sticking to the surface of the kit. 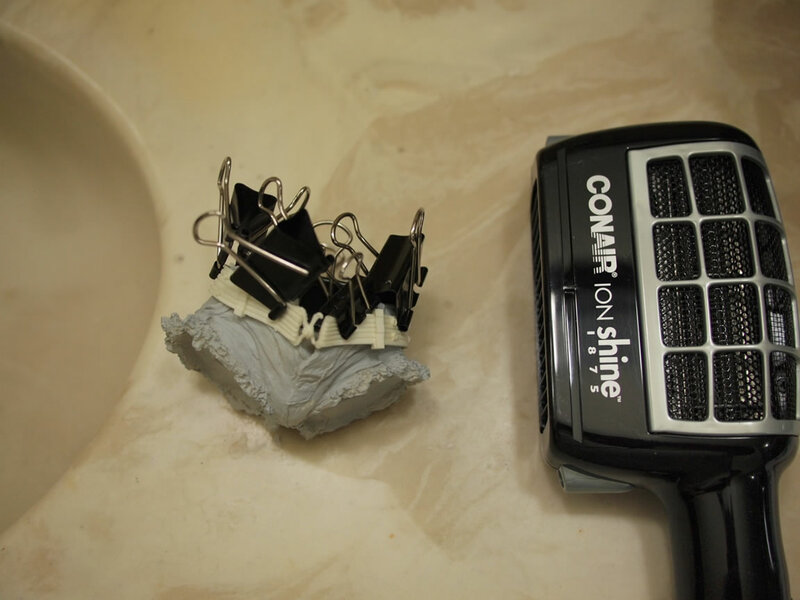 Once soaked over night, I throw the parts into an ultrasonic cleaner for some scrubbing, this removes the industrial strength cleaner completely. In lieu of the ultrasonic cleaner, a toothbrush, dish soap, and water does the same thing. The parts are laid out to dry. Once dry, they should feel completely different from when you first handled the kit parts out of the bags. The parts should feel less oily/waxy. At this point, we get the first level of primer. Once primed, a myriad of surface defects will show up in the form of pinhole bubbles, roughly sanded areas, small mold lines, gaps etc. 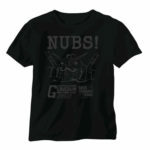 These can be taken care of with various types of putty. 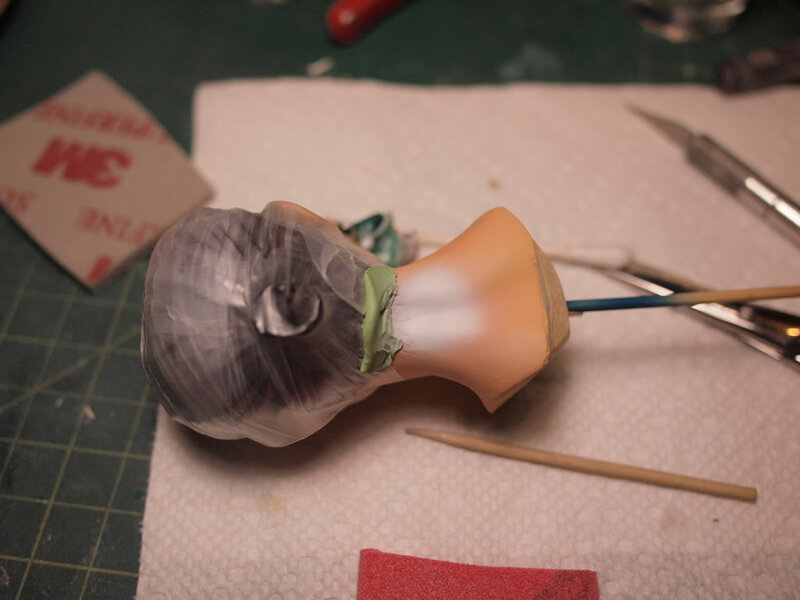 Once the pinholes are broken open and all the defects are filled and fine sanded, the parts can be primed again, and if you’re lucky, almost all of the surface defects will be fixed. In most cases, a good number will be fixed, but some touch ups are needed. In other cases, new defects you didn’t notice earlier show up. The above is repeated until the surface is perfect or you give up and move on to the next step. This is one of my favorite steps, as it’s just about near the end and the kit goes from boring grey to blooming in various colors. 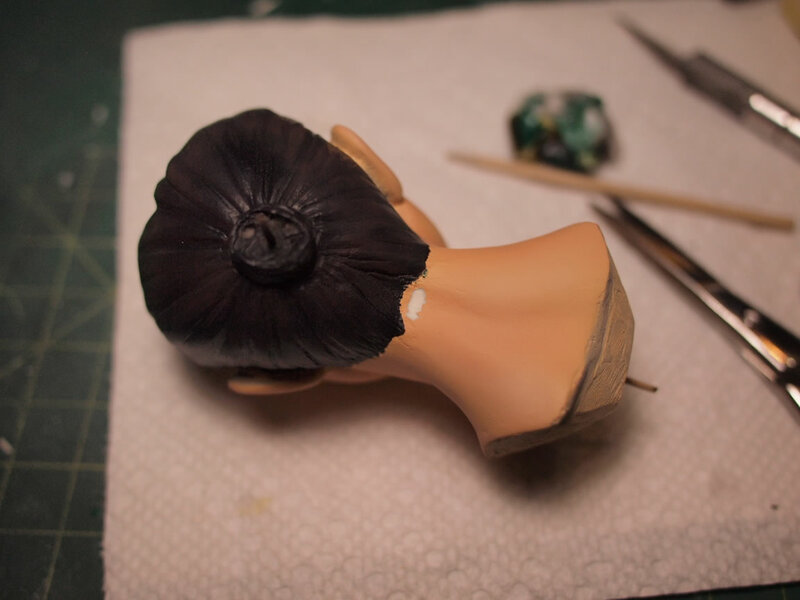 Step 3: painting, and we start with the bottom layers, skin is usually a bottom layer. Before the skin tones can be applied, I need to spray on a layer of white which removes the grey from the primer. 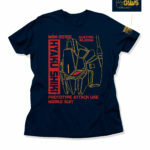 This helps keep the figure from looking like they’re dead. 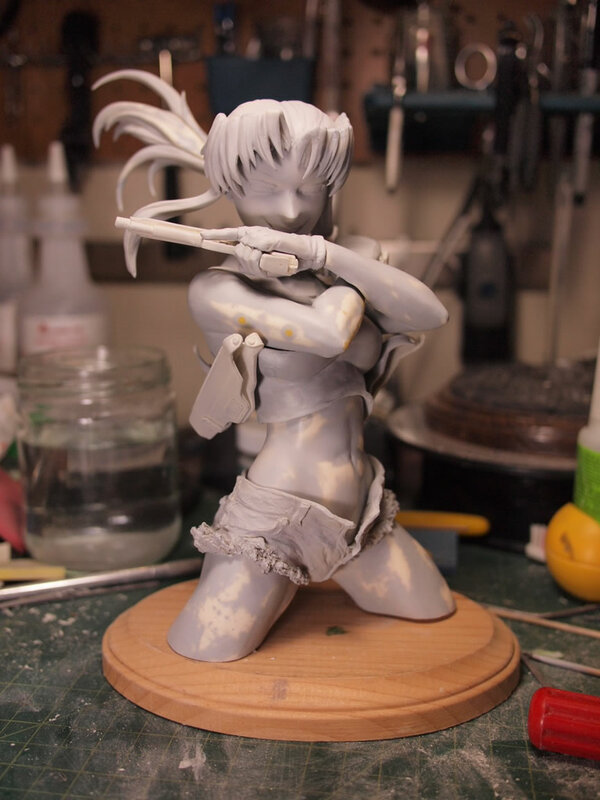 Airbrush layers are very thin, and each paint layer will inherit from the previous layer to an extent, so it is always a good idea to white out the skin areas, unless you are going for that dead zombie look. 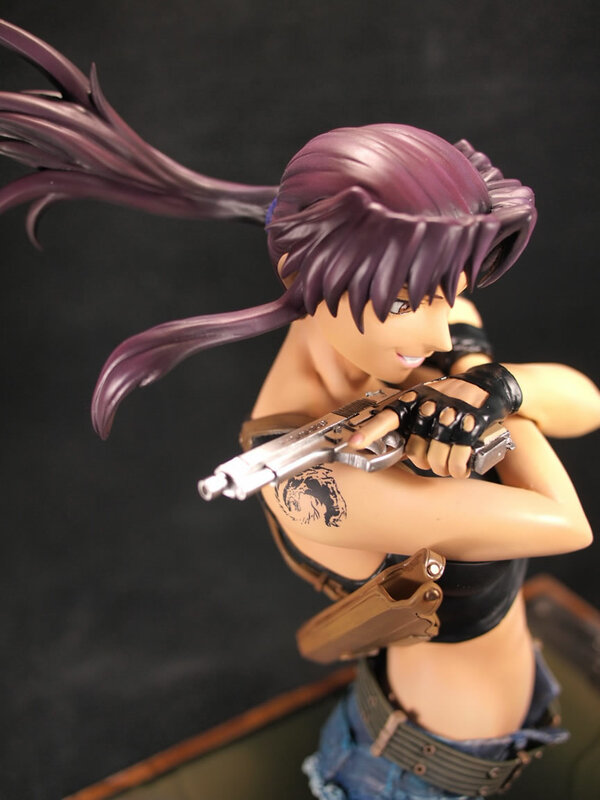 White is layered, followed by the basic dark skin tone which makes Revy look sun burnt. Highlights are added with the light skin tone, and a medium skin tone is sprayed lightly over everything to blend it all together. Revy has a tattoo along her right side of her neck and down her right arm; not feeling like drawing in the that particular tattoo, I applied my usual tattoo. 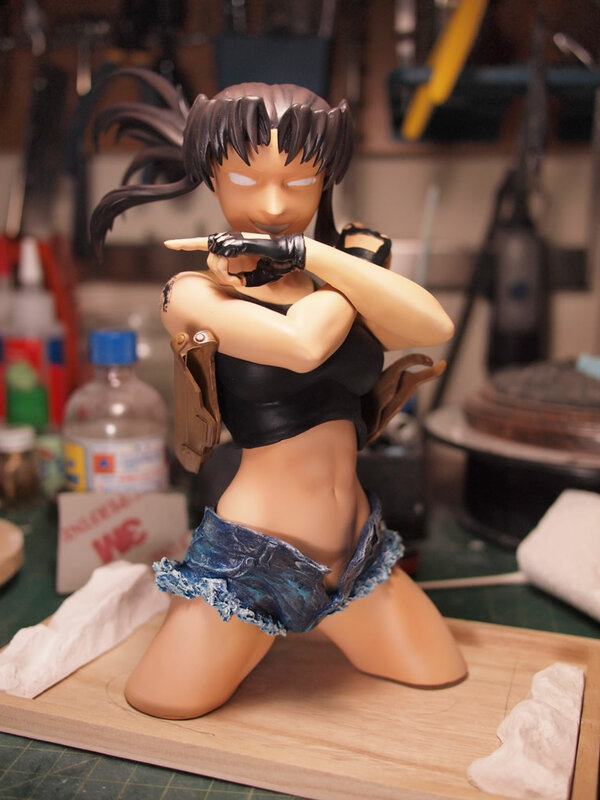 Other “bottom layer” parts are painted such as her shirt and the jean shorts. Leaving the paints to cure for at least a full day is good for lacquer based product. Anything acrylic should be left for a full week to fully cure and chemically bond to the plastic. 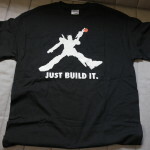 Otherwise, the masking process will just rip that paint right off. With the bottom layers painted, the successive layers will need painting, so various masking techniques are employed. First off is the tamiya masking tape, it is low tack and quite thin so is lays down nicely over the bottom and next layer of the parts. A fresh hobby blade run lightly across the tape where the two part layers meet will cut the tape so that it can be removed. 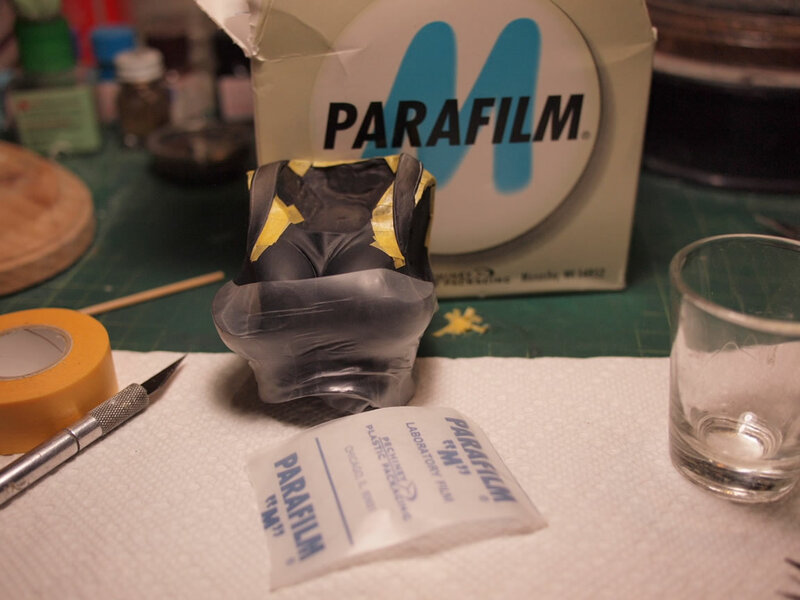 Once the main boundaries are masked with the tape, parafilm is applied to mask major areas. 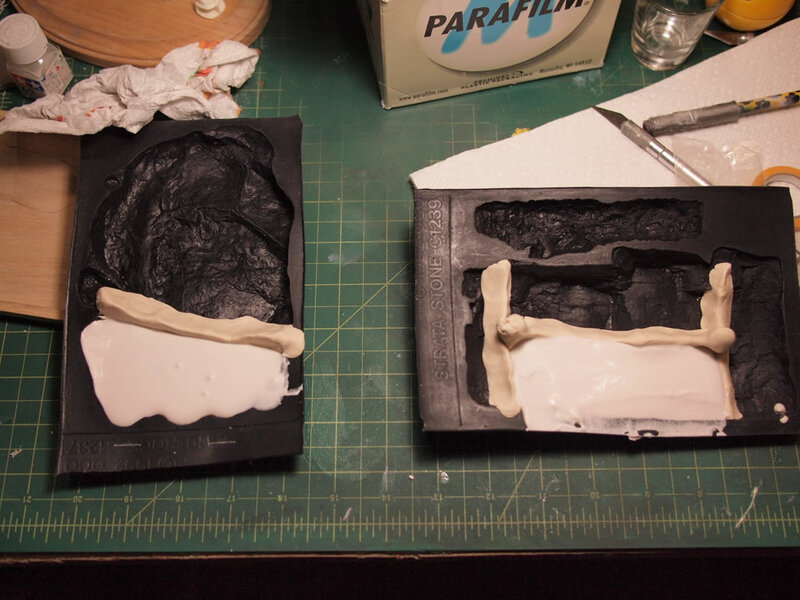 Liquid mask is applied to ensure coverage on overlapping areas of the masking tape and parafilm. The worst thing to see is to remove the mask and find a small sliver of paint over your perceived masked areas. 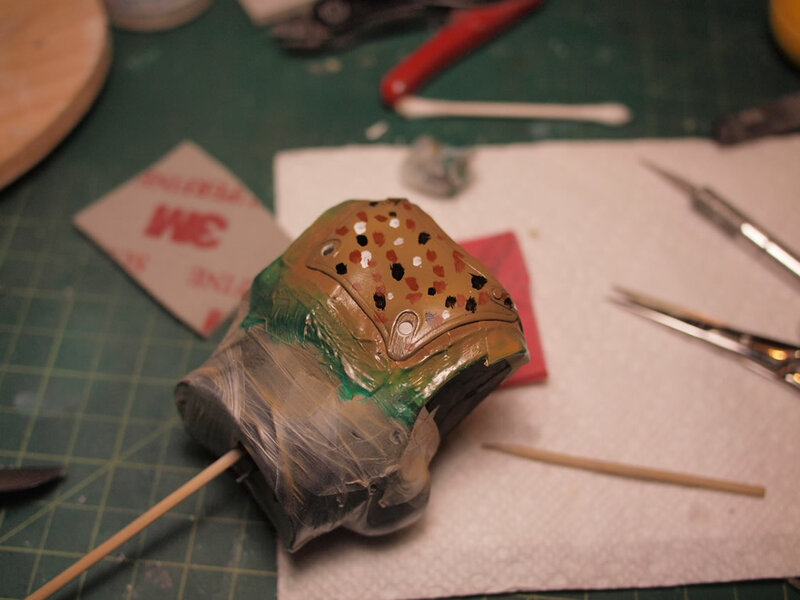 Once masked, the next layers of paint are sprayed. Returning to proper cleaning, removal of mold release, and proper cure times for paint; when removing the masks, this almost ALWAYS happens, a small patch of paint will be chipped, and usually down to the bare resin. Which means the surface wasn’t fully cleaned or the primer/paints didn’t have proper cure time. But these small patches are easily fixed. They will happen, just as the sun rises each day, it’s one of those things you will just have to deal with and get accustomed. The defect area should be lightly sanded to remove the edge formed from the layers of primer and paints. Simply painting over the affect area will not hide anything. A good trick is to take a cotton stick (Q-tip) soaked with some paint thinner (Mr Color Thinner in my case) and lightly swab the affected area. This does a few things, it ensures that the affected area is cleaned and the surrounding areas are melted down so that the straight edges are gone. Other layers are quickly masked off leaving the affected area and a bit of the surrounding area exposed. Prime, base white, and skin tones are layered. Masking is removed and the affected area is fixed. 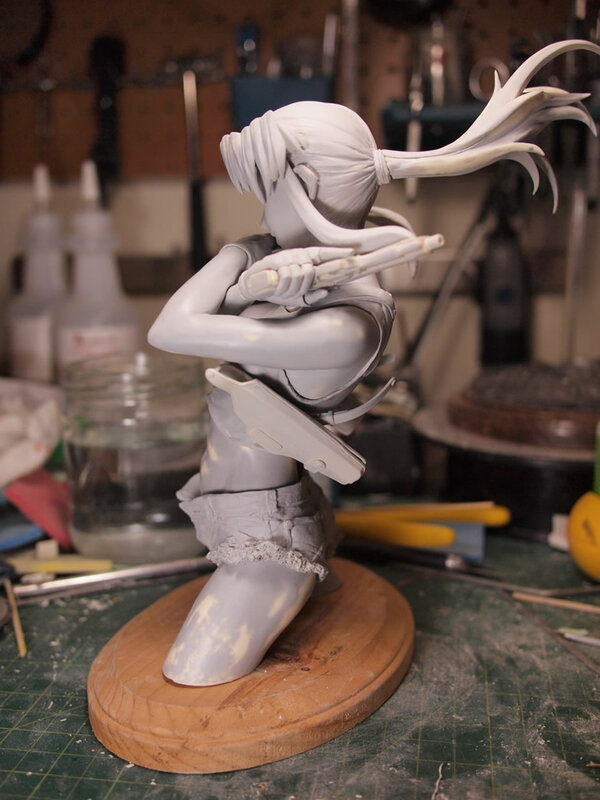 Again, this will happen, fact of light while building resin. Another layer are the eyes. 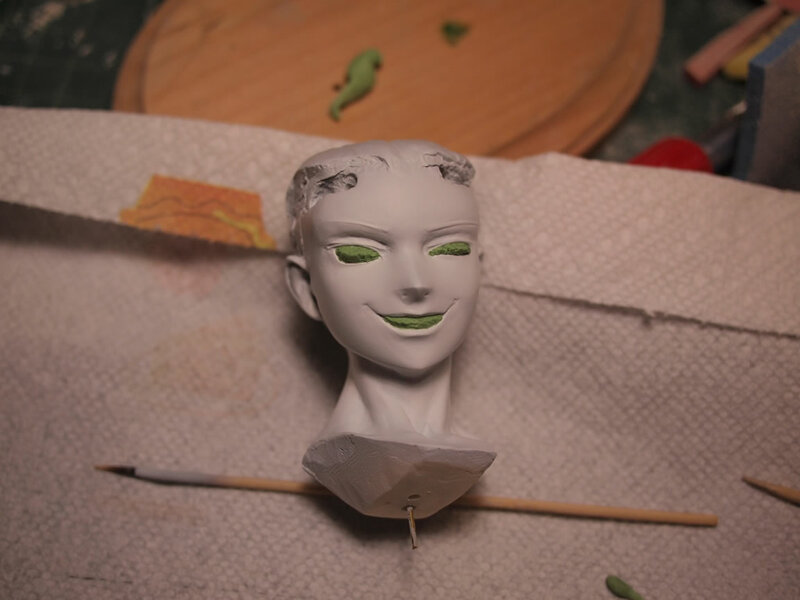 The white areas from when the skin tone was sprayed with the white over the primer is masked off. For this kit, the teeth and eyes of the head. Everything is then painted. 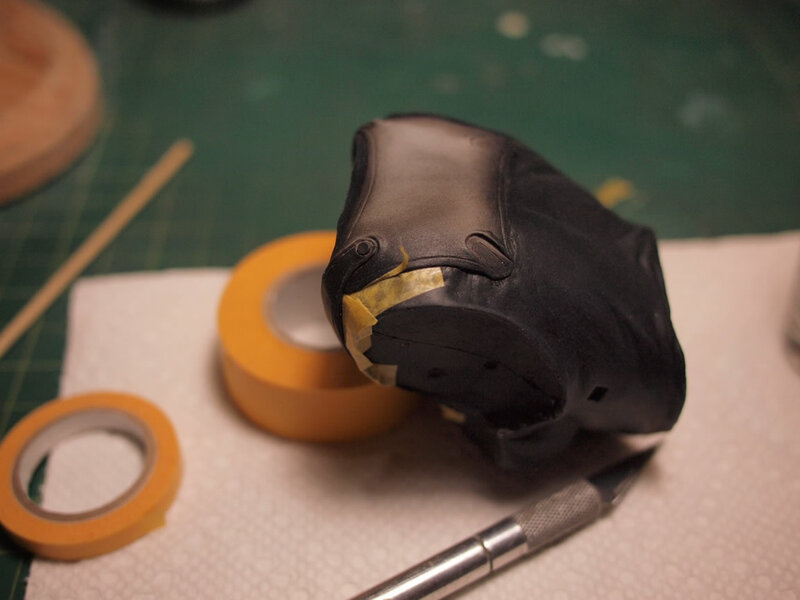 The masked is removed and hopefully these areas retain the paint adhesion. The first step I do is to draw in the eyes with a pencil. If I don’t like how the eyes look, I can erase them and start again and again. Once the eyes are set, I use a rapidograph technical pen with ink and draw in the eyes inking in the penciled areas. Next, the darker eye tone is painted in, and for this, I use enamel (oil) paint as they dry slower to remove brushstrokes and blend nicely. A lighter eye color is painted in, also enamel, that adds the highlight color to the eyes. Finally, a white reflection dot is filled and small details are adjusted. 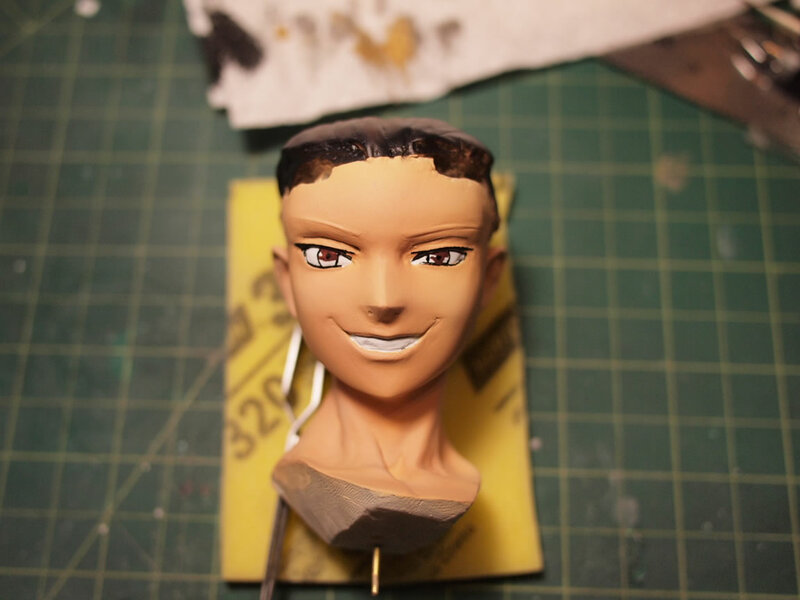 The eyes are left to dry over night, then the area is masked off and some clear gloss is sprayed over the eyes to create a more natural eye look. 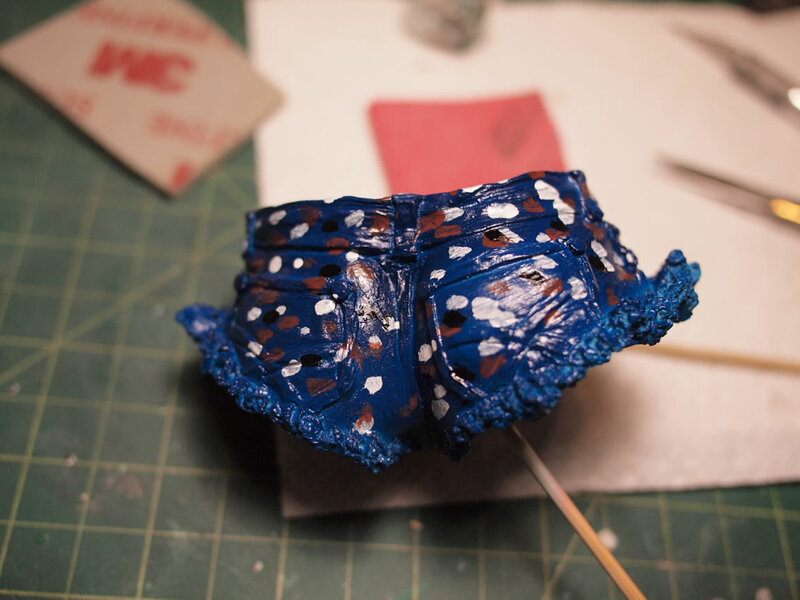 The rest of the small details use enamels to create the jeans effect and worn leather. The jean’s cutoff areas are dry brushed with white. 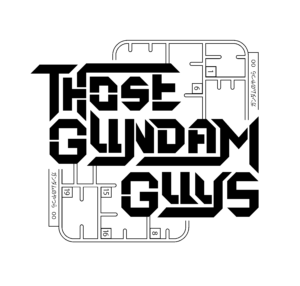 The main jean areas are dotted up with white, brown, and black to use the filter technique. these dots are then washed away with a stiff brush dipped in enamel thinner and a mixed tone of the filter is the result. Over this, white and light blues are dry brushed to add some texture to the jeans. The leather is treated the same way with a filter of different earth tones. 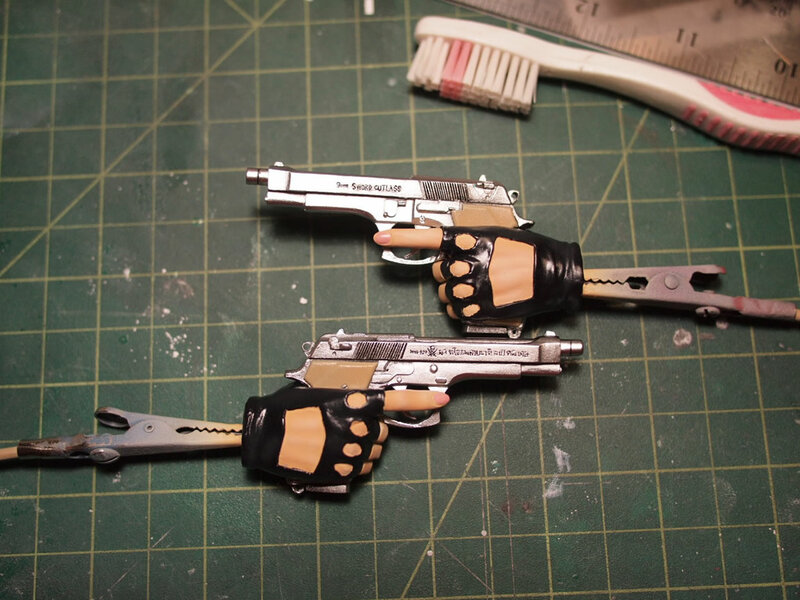 The weapons are painted in alclad metallic, chrome in this case. Once this has cured for a few days, the gun is masked and the grips painted. A semigloss is sprayed over the gun and a black enamel wash is applied to bring out the highlights of the lettering. 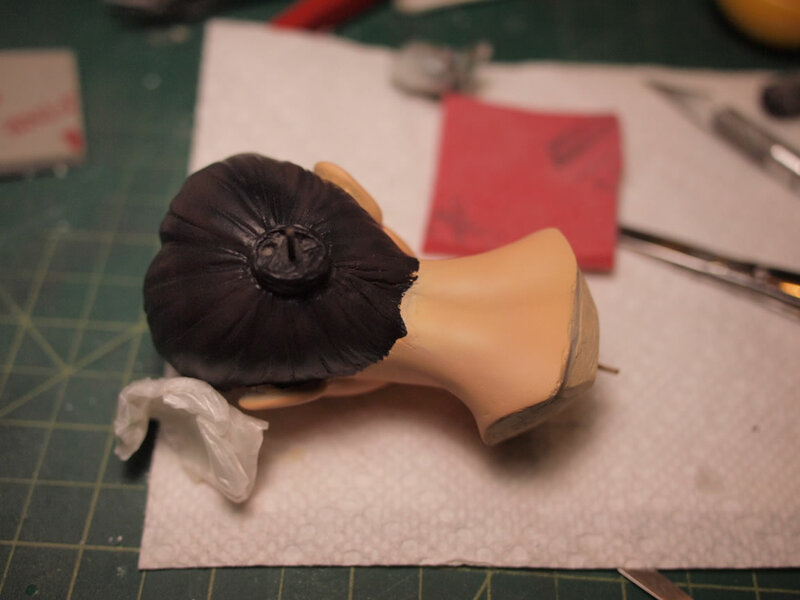 The head is masked off and the hair is shaded with Finisher’s Maroon as her hair color in the anime shows. 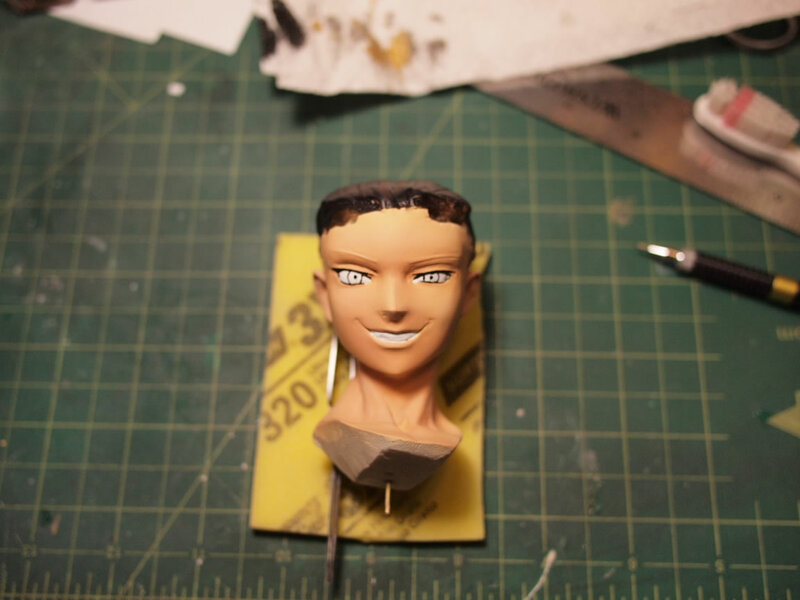 The upper body pieces are glued together and everything awaits the base. Almost done. The final step in this process Step 4: The base. Since the legs are cut off from just about the knees, I figured a display of the kit in water would look best. I picked up a shallow wood box and drew in the rough areas of the base. I will create a few rocks using the rock mold and hydrocal. 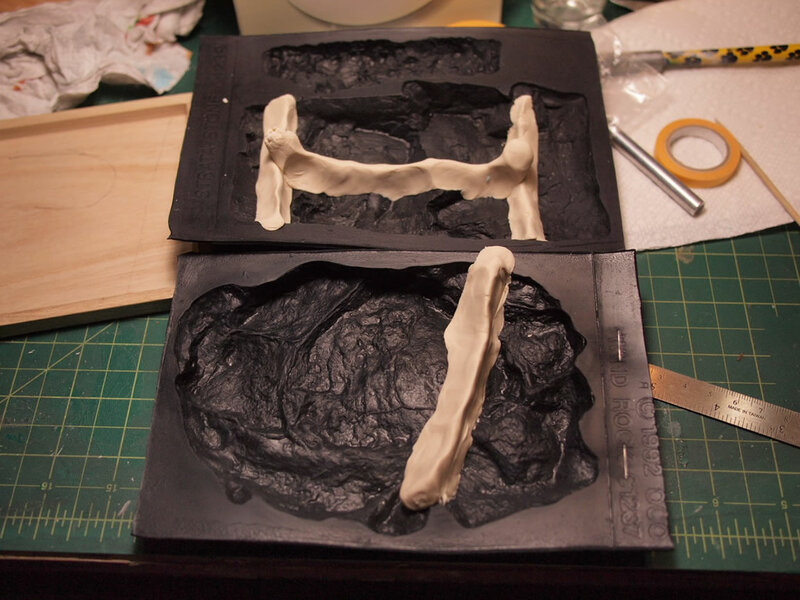 Play-dough is used to dam off the rock areas I want from the mold and the hydrocal mixture is poured and left to dry over night. The rocks are pulled and sanded down for the correct fit. 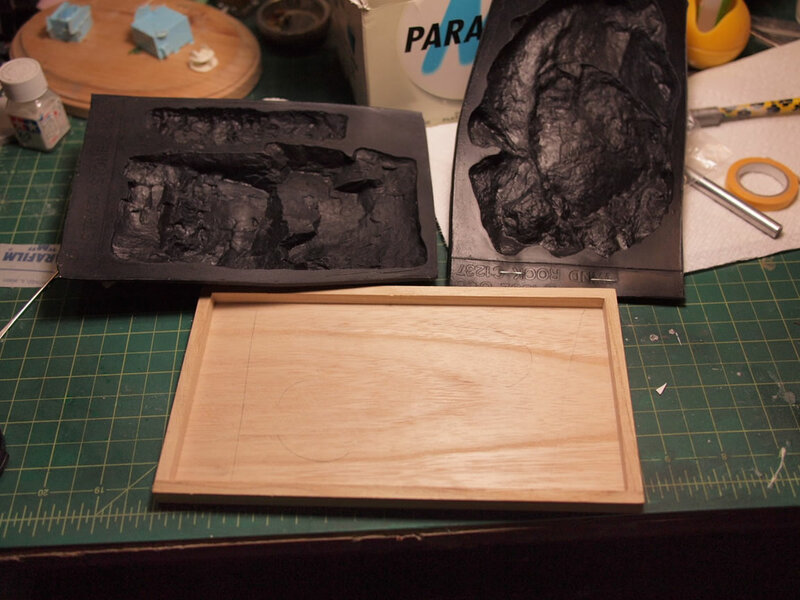 The box is painted, but I realized that the wood grain would show through, so I cut a piece of plastic the shape of the box’s bottom and glued it into place then repainted the bottom in tones of dark green to khaki green around the rocks and shallow areas. 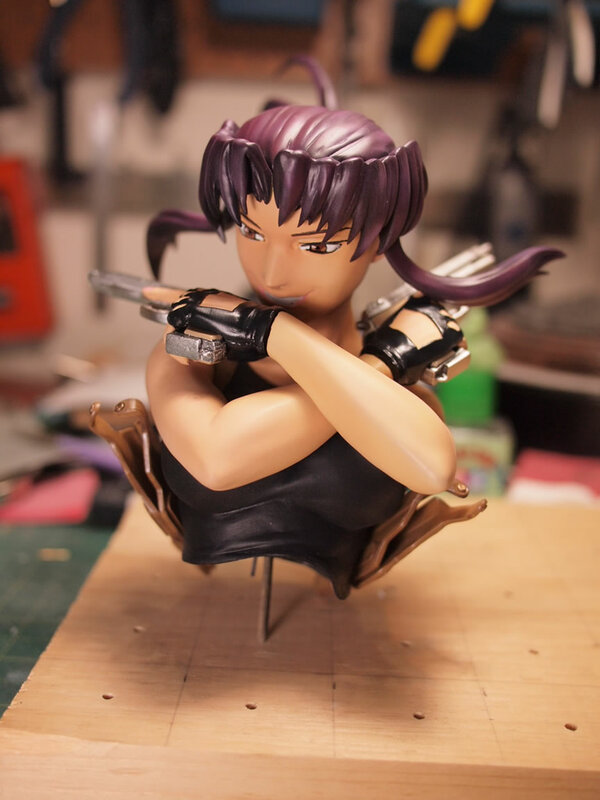 Revy’s lower half is glued to the dried base and clear resin is poured. I ran into some issues with the pour and some uncured resin, but it’s nothing I can do to fix, so a lesson learned. 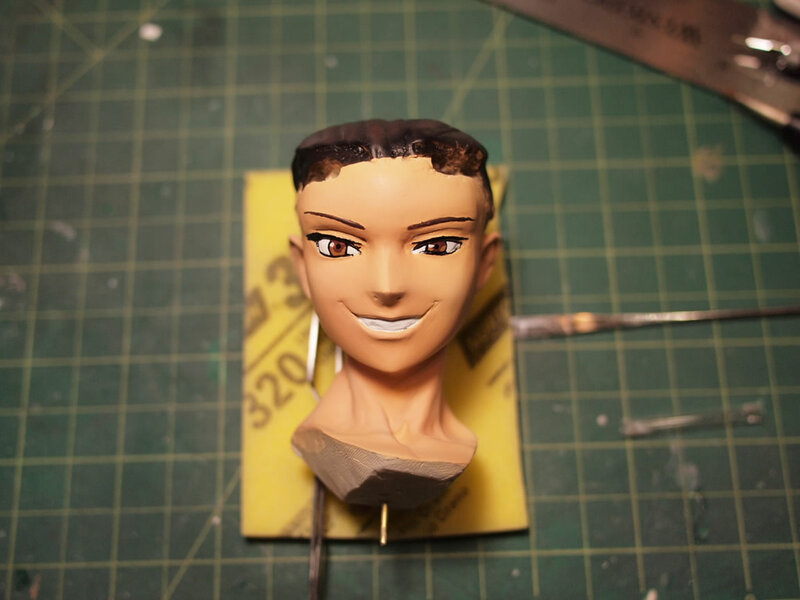 I still need to sand off the excess clear resin, but for the most part, the kit is done. 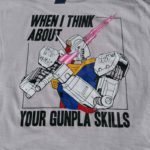 Monthly Model Build Gatherings Southern California Gundam Model Competition 1 Month Away!